With so many contact lens choices, the first part of the consultation is a discussion with your eye doctor about your lifestyle and preferences regarding contact lenses. One choice that today’s contact lenses allow you to make is whether you want to change your eye color. Different eye colors are available with contact lenses. Other options include whether you want contact lenses that are designed to be replaced daily or those which can be worn for more extended periods. Most people choose soft contact lenses for their ease and comfort. However, there are also advantages of hard or what is called rigid gas permeable (GP) lenses. All the specifics will be discussed prior to your contact lens fitting. If You Are New Contacts Wearer: If this is the first time you are trying contact lens, you need to have a complete eye exam in and evaluation to make certain you are a good candidate for wearing contacts. Your doctor will ask about your vision goals. For example, you may only want to wear contacts for sports once per week, or you want your contacts to replace your glasses for everyday activities. Additional Tests and Procedures: Your eye doctor will administer various tests designed to evaluate your eyes for contact lens wear. One important test is corneal topography, a test that maps out the different aspects of your cornea. Corneal topography displays results in a way that is very similar to the topography of mountains. The test results in a map of colors – reddish colors display steeper areas of the cornea, and bluish colors describe flatter areas. Contact lenses rest on your cornea, so it’s important that corneal curvature is measured precisely to ensure an optimal and healthy fit. Fitting the Contacts: Your eye doctor will discuss different contact lens options with you, and once you decide on which ones will be best, you will try on diagnostic contact lenses. Your eye doctor will administer another slit lamp examination to determine if the lenses fit properly. Finally, a visual acuity test will be performed to determine how well a contact lens corrects your vision. Once the contact lens fitting is complete, if you’ve never worn contact lenses, your doctor will teach you how to insert, remove and disinfect the lenses. Hygiene, cleanliness, and disinfection are essential for successful contact lens wear. Your doctor will probably ask you to wear the contact lenses for a week before returning for a follow-up visit. At your follow-up visit, your doctor will recheck the fit of the contact lenses, and ask about your vision and any problems you may be experiencing. At this point, your eye doctor will try fitting you with a new lens, or finalize your prescription. If you are dissatisfied with your vision or the comfort of the lenses, your eye doctor will schedule additional follow-up visits. Certain lenses, such as toric lenses for correcting astigmatism or multimodal lenses for correcting presbyopia, can take additional time to achieve a comfortable fit. Corneal curvature: An instrument called a keratometer is used to measure the curvature of your eye’s clear front surface (cornea). This measurement helps your doctor select the best curve and diameter for your contact lenses. If your eye’s surface is found to be somewhat irregular because of astigmatism, you may require a special lens design of lens known as a “toric” contact lens. At one time, only gas permeable contact lenses could correct for astigmatism. But there are now many brands of soft toric lenses, which are available in disposable, multifocal, extended wear and colored versions. With today’s technology, there are many brands of contact lenses available. Different contact lenses have both common and unique features, which are suitable for different users. Therefore, there is not a single brand that is best for everyone, and you must find the best contact lenses that are suitable to your own needs. When you shop for clothing, it is more important to choose clothes because they fit, rather than because they are a certain brand. The same goes for contact lenses. There are many different brands of contact lenses to choose from, and it’s important that you choose the brand that is right for your personality. Choose a lens which provides a good fit, provides good vision and is comfortable to the eye. There is a lot of advanced technology in contact lenses. Some brands offer more breathability and wettability, some offer distance and reading combinations within one contact lens. Now patients with various eye conditions, including astigmatism and dry eyes, can wear contact lenses designed especially for them. Our eye doctor will evaluate your eyes and your living environment to recommend the best possible contact lenses for you. You can also ask your eye doctor about the latest developments in the contact lens industry. Make sure your doctor is offering the latest technology to you. Your eye doctor is an expert in eyes and knowing which contact lenses will be best for you. It’s best to follow your eye doctor’s recommendation. The contact lens fitting involves follow-ups, to be sure that the contact lenses are right for you, and if they are not, your eye doctor is the best person to evaluate what is not working well, and which contact lenses might be a better choice. Glasses fog up with changes in temperature. Contacts don’t fog up. Eyeglasses can be problematic to wear in rain or snow. Contact lenses won’t collect precipitation and blur your vision. Glasses are an unnatural, distracting barrier between your eyes and the world. Contacts don’t detract from your natural appearance; they let people see your eyes. 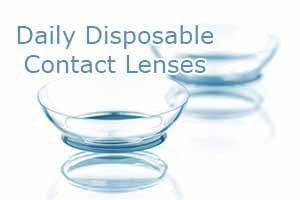 As Greensboro’s contact lens specialist, Fox Eye Care carries a complete selection of the latest multifocal daily disposable contact lenses. Schedule a contact lens exam or fitting today. Our optometrists will perform a specialized eye exam for contact lenses. Routine vision testing and eye exams don’t measure everything that’s needed to issue an accurate contact lens prescription. Disposable contact lenses are the ultimate in convenience. Many people prefer these popular lenses for their high level of comfort. Reading glasses can be a nuisance and many people find them unattractive. Bifocal and multifocal contact lenses can be a great alternative! They are available in rigid, gas permeable and soft versions. 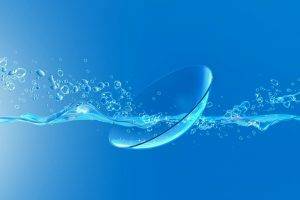 Hard contact lenses offer some distinct advantages, including crisp vision, high oxygen permeability, and durable wear. Some vision conditions cannot be corrected well with standard contact lenses, such as keratoconus, dry eyes and presbyopia. We fit hard-to-fit patients with specialized contact lenses in our Greensboro office. Years ago, astigmatism used to be a reason why people couldn’t wear soft contact lenses. This is no longer true, as toric contact lenses provide a new, great option for many of our patients. A wide range of top-quality brands are available in our Greensboro optical store. 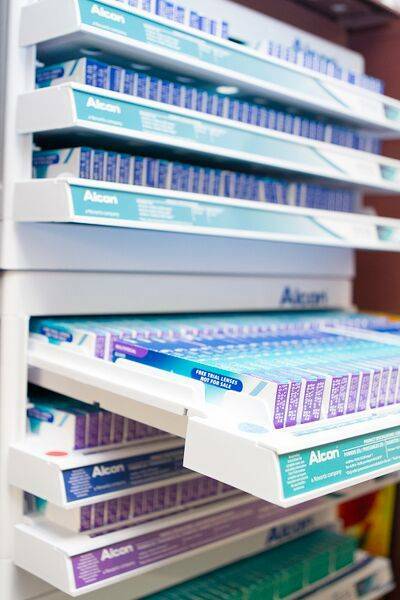 Stop in anytime with your current vision prescription to purchase new contact lenses.